Stretchable ultraviolet photodetectors with fast response have wide applications in wearable electronics and implantable biomedical devices. However, most of the conventional binary oxide nanowires based photodetectors exhibit slow response due to the presence of a large number of surface defects related to trapping centers. Herein, with interlaced SnO2-CdS nanowire films as the sensing materials, we fabricated stretchable ultraviolet photodetectors with significantly improved response speed via a multiple lithographic filtration method. Systematic investigations reveal that the interlaced-nanowire based photodetectors have lower dark current and much higher response speed (more than 100 times) compared with pure SnO2 nanowire based photo-detectors. The relevant carrier generation and transport mechanism were also discussed. In addition, due to the formation of waved wrinkles on the surface of the nanowires/PDMS layer during the prestretching cycles, the SnO2-CdS interlaced nanowire photodetectors display excellent electrical stability and stretching cyclability within 50% strain, without obvious performance degradation even after 150 stretching cycles. As a simple and effective strategy to fabricate stretchable ultraviolet photodetectors with high response speed, the interlaced-nanowire structure can also be applied to other nanowire pairs, like ZnO-CdS interlaced-nanowires. Our method provides a versatile way to fabricate fast speed ultraviolet photodetectors by using interlaced metal oxide nanowires-CdS nanowires structures, which is potential in future stretchable and wearable optoelectronic devices. Li L, Lou Z and Shen G proposed the idea; Li L and Lou Z designed and engineered the samples; Li L, Lou Z, Chen H, and Shi R performed the experiments; Li L, Lou Z and Shen G wrote the paper. All authors contributed to the general discussion. 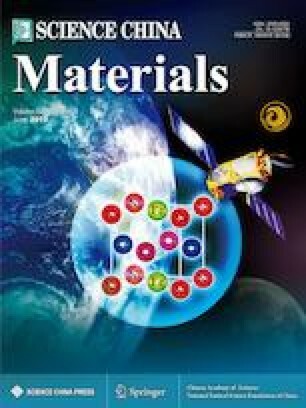 Supplementary material is available for this article at https://doi.org/10.1007/s40843-019-9416-7 and is accessible for authorized users. 快速响应、可拉伸紫外光电探测器在可穿戴电子和嵌入式生物医学器件中有广泛应用. 然而, 对于大多数基于传统二元氧化物纳米线的光电探测器来说, 大量表面缺陷产生的俘获中心使得探测器表现出非常慢的响应速度. 本工作利用SnO2-CdS交叠纳米线薄膜作为敏感材料, 通过多重模板抽滤法制备出了响应速率显著提高的可拉伸紫外光电探测器. 研究表明, 与纯SnO2纳米线光电探测器相比, 基于交叠纳米线的光电探测器具有更低的暗电流和更大的响应速率(>100倍). 此外, 本文还讨论了相关的载流子产生和传输的机制. 另外, 由于在预拉伸循环过程中纳米线/PDMS层的表面形成了波浪形的褶皱, SnO2-CdS交叠纳米线薄膜光电探测器在50%的拉伸应变下展现出了优异的电学稳定性和拉伸循环特性,在150次拉伸循环后仍未表现出明显的性能衰减. 作为一种简单有效的制备快速响应可拉伸紫外光电探测器的策略, 交叠纳米线结构也可以被应用到其他纳米线组合中, 比如ZnO-CdS交叠纳米线. 金属氧化物-CdS纳米线交叠结构制备能够快速响应的紫外光电探测器是一种普适的方法, 其在未来的可拉伸和可穿戴光电器件中具有巨大的应用潜力. This work was supported by the National Natural Science Foundation of China (61625404, 61888102 and 61574132), and the Key Research Program of Frontier Sciences, CAS (QYZDY-SSWJWC004).